Irradiance is a measure of the electromagnetic energy that reaches the earth's atmosphere per second, per meter. This energy affects everything on the planet, weather, life. More specifically, it is important to understand what this energy is and how it can be used. The total quantity of energy emitted from the sun's surface is approximately 63,000,000 Watts per square meter (W/m2). Less than one-half of one billionth of a percent of the sun's energy reaches the earth, the reason for this is the Inverse Square Law. Basically, the Inverse Square Law states that the amount of energy (e.g., solar radiation) that strikes a particular object (e.g., the earth) varies with the squared distance from the source. As a result of this law, if the intensity of radiation at a given distance is one unit, at twice the distance the intensity will become only one-quarter. At three times the distance, the intensity will become only one-ninth of its original intensity at a distance of one unit, and so on. Given the amount of energy radiated by the sun and the average Earth-sun distance of 149.5 million kilometers, the amount of radiation intercepted by the outer limits of the atmosphere can be calculated to be around 1,367.7 W/m2 (watts per square meter). This number is referred to as the "solar constant". Note 1: When measuring solar irradiance (via satellite), scientists are measuring the amount of electromagnetic energy incident on a surface perpendicular to the incoming radiation at the top of the Earth's atmosphere, not the output at the solar surface. Note 2: Since we've started measuring the amount of irradiance from the sun using satellites – it has been noted that there are slight variances in this number -- so although we use the term solar constant – it is more like the current solar irradiation average. As a result of the fusion of four hydrogen atoms into a helium atom in the sun's core, energy is released. Once the energy works its way to the surface of the sun and released into space we refer to it as electromagnetic radiation. 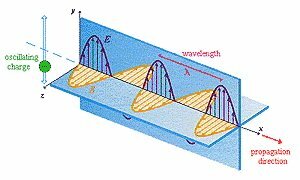 Electromagnetic radiation is a phenomenon that takes the form of self-propagating waves in a vacuum or in matter. It comprises electric and magnetic field components, which oscillate in phase perpendicular to each other and perpendicular to the direction of energy propagation. Electromagnetic radiation is classified into several types according to the frequency of its wave; these types include (in order of increasing frequency and decreasing wavelength): radio waves, microwaves, terahertz radiation, infrared radiation, visible light, ultraviolet radiation, X-rays and gamma rays. 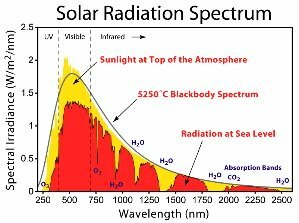 Until the advent of satellites, our knowledge about the composition of solar energy was incomplete, as only a very few wavelengths, such as the visible spectrum, radio frequencies, and some ultraviolet wavelengths reach the surface. Ultraviolet C (UVC) varies from 100 to 280 nm. The term ultraviolet refers to the fact that the radiation is at higher frequency than violet light (and, hence invisible to the human eye). Owing to absorption by the atmosphere very little reaches the Earth's surface (Lithosphere). This spectrum of radiation has germicidal properties, and is used in germicidal lamps. Ultraviolet B (UVB) varies from 280 to 315 nm. Most of UVB and UVC is absorbed atmosphere, and along with UVC is responsible for the photochemical reaction leading to the production of the Ozone layer. Ultraviolet A (UVA) ranges from 315 to 400 nm. It has been traditionally held as less damaging to the DNA, and hence used in tanning and PUVA therapy for psoriasis. Visible range or light spans 400 to 700 nm – ranging from blue at the short end to red at the higher range. There are also small amounts of energy in the radio, microwave, X-ray and gamma ray bands also released. The following graph shows the approximate distribution of energy across the electromagnetic spectrum. Source: This image is an original work created for Global Warming Art. Irradiance can be understood as a stream of photons, which are massless particles each traveling in a wave-like pattern and moving at the speed of light. Each photon contains a certain amount (or bundle) of energy, and all electromagnetic radiation consists of these photons. The only difference between the various types of electromagnetic radiation is the amount of energy found in the photons. Generally, speaking the smaller the wavelength – the more energy is contained in the photon. Photons, carrying energy produced in the sun (primarily in the form of blue light) releases this energy when it comes in contact with a solar panel. In so doing it causes electrons to move and electricity to be produced. Insolation measures the amount of irradiance that hits the ground, and unlike irradiance is measured horizontally (rather than perpendicularly). Click on the appropriate link to return to the top of this page about Irradiance or to return to our overview about Solar Energy.